The marijuana industry as an emerging global movement is now becoming a major interest in the world of business. In fact, Cannabis related businesses are booming in nations where it is legal. The swift legalization of marijuana in different areas of the world has sparked the interest of investors and businessmen to capitalize in this plant. The potential of marijuana as a multi million dollar cash crop seems to be the next frontier for countries who have legalized the plant for medical and recreational use. Cannabis business or ‘Cannabiz’, is becoming a sought after venture in many parts of the world. Stock prices of medical marijuana companies are rising and everything seems to be lining up for the rush of capital at the end of prohibition. What we see in the US is massive, however some countries are specifically positioning themselves to become leaders in this new industry. The Israeli government for example have been developing a good understanding of the economic benefits of cannabis. Today Israel is on the forefront of the global medical cannabis industry. It has been made easier to conduct medical trials and studies in Israel compared to any other country in the world. This literally opens up a lot of opportunities to work with the rest of the world, who are not quite as aware of the economic benefits and advantages. The Hebrew University is building up its IP bank of cannabis patents, increasing the likelihood of a thriving local industry in the future. No other government has such a good sense for the economic prospects of this crop. In most countries it is still a ‘developing industry’ with grey areas. There are roadblocks, challenges and regulations that make it very challenging to navigate for entrepreneurs. Despite these challenges, marijuana companies are actually doing pretty well in its financial sector. What businesses could you invest in? 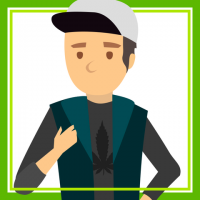 According to the 2016 marijuana fact book, 90% of all dispensaries, recreational stores, infused products producing companies and wholesale cultivators are generating a profit or at least breaking even in their Cannabiz venture from 2014 to 2015. Leading the pack has been the infused product companies that gives out a 91% profitability rate. If infused products cannot make a profit, they at least break even. Infused products are Cannabis- infused products like edibles, oils, ointments and more. 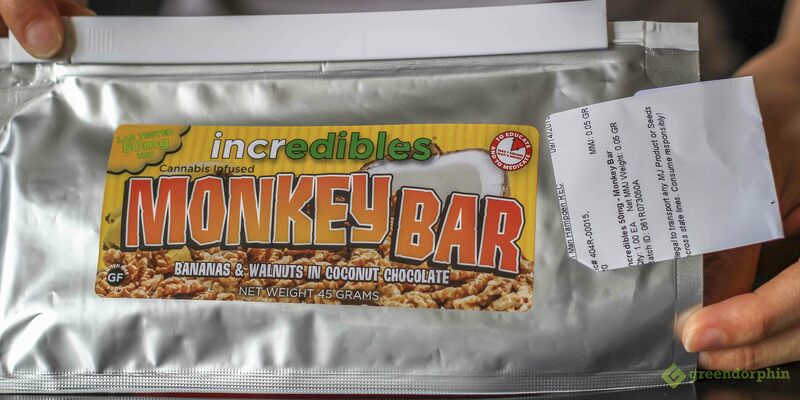 Many ‘edible’ companies are popping up across Colorado, California and beyond. Also edibles are the fastest growing product lines in dispensaries in Colorado driving up the demand significantly with no signs of slowing down. Chocolate and cookies are among some of the favourites in the edibles. 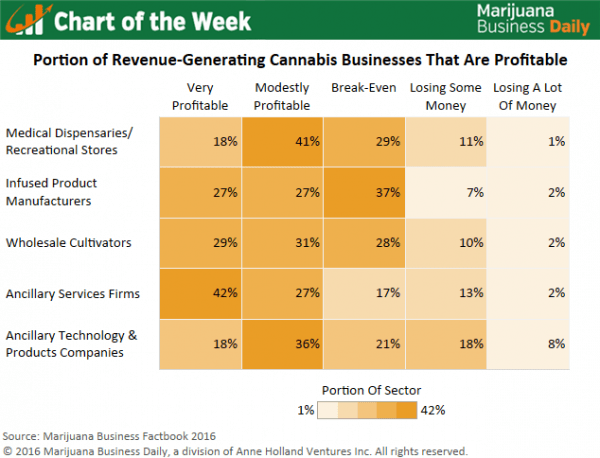 Start up costs for cannabis business entrepreneurs are potentially low, making it an attractive step into the industry. If you consider exploring this option, exercise caution to ensure you are aware of legal liabilities and responsibilities. It may look simple to run a business producing infused cannabis products, however it is quite involved. Legal advice and assistance is required and it’s best to do things correctly to stay on top of the ever changing rules and regulations. Cultivating plants could be very profitable for those that are prepared and know what they are doing. Growing cannabis is federally illegal and even though the States allow cultivation under their regulatory framework, the federal prohibition makes things difficult. This difficulty surfaces on many levels, and growers have been subject to crop seizure by federal agents making huge dents to the finances of the cannabis business. Pete Williams, the owner of Medicine Man in Denver says you have to be prepared to work hard to make it successful. Dispensaries in some states and countries have a significant start up cost. Costs could be as high as 5 to 10 million dollars for example in New York. However, in California you can open about 20 dispensaries for that much. Dispensaries also run on higher operational costs, producing the highest median operational cost in the industry at 600,000 dollars. Although a lot of ancillary companies have been successful in their Cannabis business venture, it is reported that 26 percent of these companies are losing some or a lot of money. Those companies that are struggling are usually startup companies that have not gained their footing yet. Companies that have already stamped their name in the Cannabiz industry are doing pretty well and is estimated to do much more in the future. Companies that have been with the industry for a few years now and have already penetrated the market will most likely succeed and yield the most profits in 2016. Branding is also becoming a major part of the Marijuana industry and an area where new and old companies are investing in. Up until a year ago, marijuana related companies have not put too much thought into branding their products because of its exclusive, almost under the radar appeal. However, as more companies enter the industry (on mass) the need to set themselves apart has become an essential marketing strategy. New Marketing companies are popping up specialising in Branding Marijuana products and building websites. So we are seeing not only a need for it but a new Niche for marketing companies to get involved in. The Cannabiz industry has also found more revenue in its online exchange via New Media. The demand for cannabis exceeds its supply in most online cases. Distribution of products are also limited in countries that have marijuana laws set up. Countries that don’t have legal marijuana laws in place will not have the convenience to order huge amounts of cannabis online from suppliers. In the United States, it is estimated that in 2020 the cannabis industry could grow and release a profit margin of 44 billion dollars if legalization and trends regarding recreational and medical marijuana continue. Retail marijuana sales are said to hit 3.5 to 4.5 billion in 2016 which is a huge increase compared to the 3 to 3.3 billion dollars it generated in 2015. Sales could climb to 8 billion dollars in 2018 if marijuana trends continue and could eventually hit 5 folds in 2020. Recreational marijuana use has had a huge impact in the growth of the industry and recreational marijuana sales could already surpass those of medical marijuana sales in 2018. Do you think the legalization of marijuana and the potential business which will grow from it will benefit the economy? SHARE with us at the comment box below!